This colorful bed is seen from many places in the garden, from the interior, and both entertaining terraces. The flowers supply the client with bouquets from May through frost. The Golden Locust is a focal point and has plenty of room to expand. The orange metal sculpture, Cupid's Dart by Shannon Buckner of Bent Productions, is stunning standing 6' high in the air surrounded by color enhancing plants. The orange, chartreuse, purple continues. The orange Helenium ‘Moerheim Beauty’ is especially eye-catching with the purple Russian sage and Nepeta 'Walker's Low and lavenders and the yellow yarrows and purple smoke bush. 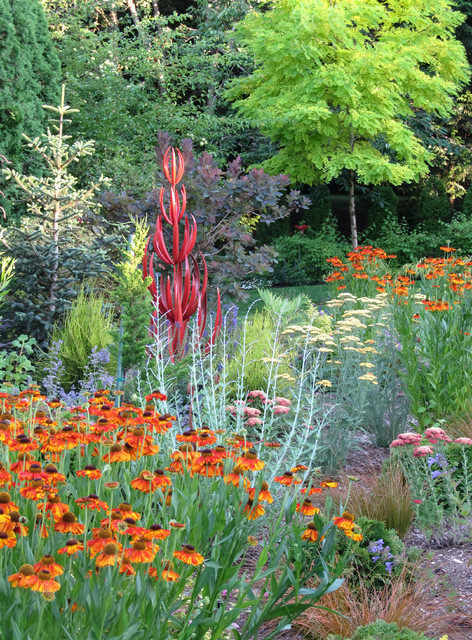 Full sun and drought tolerant perennials make for beautiful summer gardens.